Back for another year of fantastic food and music, the Beach, Boogie, and BBQ Festival celebrates its 12th annual event on September 1 and 2, 2017 at the Market Common in Myrtle Beach, South Carolina. This late summer festival is the perfect way to maximize the foodie fun of your beach vacation. 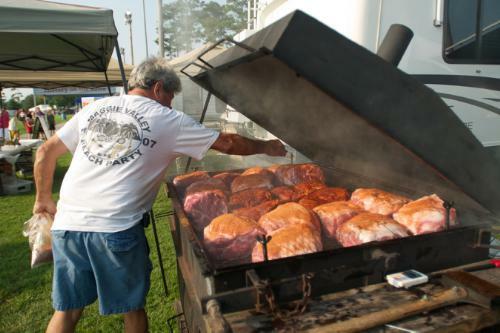 An Official BBQ Championship of South Carolina, the Beach, Boogie, and BBQ Festival awards upwards of $8,600 in cash and prizes to more than 25 competing teams of BBQ aficionados. Teams battle it out for points to find out whose BBQ will reign supreme. All of the fun starts on Friday, September 1 at 6pm, when participants will converge for the finger-licking good Wing Competition and Tasting. Visitors can also explore the beer garden and shop local arts and crafts vendors. Live entertainment will be performed on the Main Stage from 6pm-9pm. Saturday's events run from noon until 6pm, and will feature several competitions including the 2nd Annual BBQ Derby, Kansas City Barbecue Society BBQ Competition, and Corn Hole Competition. Don't forget to check out the Myrtle Beach Car Club Show that will be on-site as well. Stick around for the end of the event, when awards will be announced. Like Friday, Saturday will also feature the Beer Garden and Live Entertainment. Though the summer season may be drawing to a close, festival season is just beginning. You will love taking a bit of time out from your Myrtle Beach condo rentals experience to celebrate delicious food, great music, and thrilling competition at the 2017 Beach, Boogie and BBQ Festival, hosted at the Market Common.